FREETOWN—Milo jazz is a musical reflection of the competing forces at work within Sierra Leone. Born of tradition, it struggles along an evolutionary path between old and new within the confines of unpleasant economic realities. Milo jazz has existed at least since the early 1960s. Perhaps an offshoot of the old goombay rhythm bands or the music of hunting societies, milo (pronounced my-low) has become well established on its own. 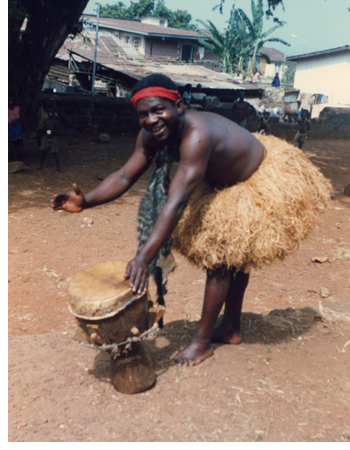 Chief practitioner of the genre is Freetown’s Dr. Olo—in fact he is quick to take credit for its invention, claiming to have developed the beat and coined the name. Milo was his old nickname, says Olo, but since that was also the name of a popular brand of powdered milk, he hung the term “jazz” on it so people would know it was music. This explanation will no doubt be disputed by others involved in the music’s evolution. Sam Coker and His Milo Jazz, for example, was one of a number of groups helping to bring it to prominence in the sixties. Whatever the circumstances of its origin, there is no disputing the fact that Dr. Olo is the current king of milo jazz. Playing on instruments mainly of local origin, Olo and his band produce an infectious chug-a-chug beat spiced with amusing lyrics that put them in constant demand for weddings, parties, and dances throughout the country. His popularity earned him recognition in this year’s national honors and awards as he received the Certificate of Honor. Dr. Olo is Olofemi Israel Cole, born in Freetown and destined to be a musician almost from the start. “Den sen mi go skul, na de a go sidom de bit kop,” he recalls [They sent me to school; that’s where I settled in and began beating on a cup.]. He soon dropped out of school but graduated from cup beating to plucking out rhythms on kongoma, a large wooden box with three hacksaw blades mounted over a sound hole. When the film Calypso hit Freetown theater screens in 1962, it convinced him that a musical career was possible. His playing became more purposeful, and together with friends he formed a small street ensemble. At about the same time, Olo came to the attention of the late guitarist Ebenezer Calender. Calender occasionally called on him to provide rhythm during his recording sessions at Sierra Leone Broadcasting Service. Olo also performed at weddings and parties with Calender and often played engagements Calender couldn’t undertake. By the late seventies, as Calender’s career began winding down, Olo started to push his own in earnest. Sierra Leone’s economic decline has inadvertently helped to increase the popularity of milo jazz. Freetown’s record industry and the pop bands that fed it were largely dependent on imported equipment and overseas record pressing facilities. As the country’s foreign exchange crisis and accompanying currency devaluation intensified, import dependent businesses declined drastically. Record producers went out of business, and many bands disintegrated or left the country. At the same time, taping studios began to spring up, both as cause and effect of the demise of the record producers. Taping studios, while still import dependent, are so on a much smaller scale. So too are the milo jazz bands like that of Dr. Olo. Olo makes his music largely on locally produced instruments and records strictly on low cost cassette tapes. His eight-member band uses kongoma; triangle; bass box, producing a bass drum sound; timing box, producing a higher pitched drum sound; answer bass drum; two in one drum, a drum with two heads of differing pitch; and various shakers and rattles. This rhythmic array produces an incredible, driving beat that Olo enhances with a lone western instrument—either mouth organ or bugle—and his humorous call and response tales of Sierra Leonean life. Getting his music on tape has boosted Olo’s popularity around the country. He produced his first cassette with the help of Dwight Coker, a teacher at Freetown’s Technical Secondary School. These days he records in a back room at Tapes International on Regent Street. The implement of record piracy is, ironically, helping to nurture and propagate a fledgling musical idiom. Just as Jamaican mento eventually yielded reggae, milo jazz is ready to issue its own offspring. What is required now is a Sierra Leonean Duke Reid or Coxone Dodd skillful enough to professionally produce the music and astute enough to overcome Sierra Leone’s economic handicap and the prejudice of an international top-forty mentality.